The late 1990s were financially tenuous times for the club. But the years 2000 and 2001 saw greater stability and increased interest in the club. The club saw fit to make some small donations to deCycles, the Bloomington South Solar Racing Team as well as to the county highway department for “Share the Road” signs. In Fall 2002 the BBC board approved donations to two local groups, DeCycles and the BHSS Solar Bike Team, and was actively exploring other organizations to which we might donate. We also donated to America Bikes (a nonprofit coalition of national bicycling organizations). By 2003 the RAIN Ride, under Joe Anderson’s direction, was achieving not just financial stability, but actually turning a significant profit, with the introduction of jersey sales, which Joe and Barbara Anderson initiated. The club began to explore ways of using these funds in more systematic ways. In the fall of November 2003 the board approved donations totaling $6200 to DeCycles, the BHSS Solar Bike Team, Indiana Bicycle Coalition, America Bikes, Adventure Cycling, and the League of American Bicycles. At the same time we felt a need to be more intentional and systematic in the use of these funds. An ad hoc grants committee chaired by V.P. Mike Navarro was formed to establish basic policies and procedures for a program of grants. It reported a proposal to the board in October 2004. The proposal was announced to the club at its annual meeting and banquet in March 2005. The first year of the new procedures started with grant applications in the fall of 2005, with awards totaling about $10,000 taking place in spring 2006. DeCycles, the Solar Bike Team, and the Indiana Bicycle Coalition again received grants, as did Monroe County United Ministries, the Shalom Community Center, Girl Scouts, the Community Bike Project, Bloomington Parks and Rec, and Team Marshall (a female, African American Little 5 team, for their outreach efforts). 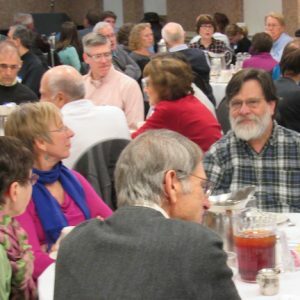 Saturday evening, February 25, marked the BBC’s annual meeting and banquet held at the Monroe County Convention Center. Just in time for the 2017 ride season, which begins the first Saturday in March! A really good crowd showed up and, indeed, a couple extra tables needed to be set up to accommodate everyone. 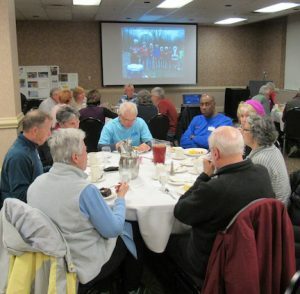 Treasurer John Kalill gave an overview of club accounts, which have healthy balances, to fund RAIN expenses ahead of the event, club functions, grants, and additional funds available to be targeted toward special projects. Jim Schroeder announced the recipients of this year’s grants: Boys and Girls Club of Bloomington, Boys and Girls Club of Mooresville, deCycles, Hoosier Mountain Bike Association, and Stepping Stones. In addition the club awards small grants to municipalities along the route of RAIN. Lots of volunteers are needed to make the event a success. Contact Yusuf! Membership Chair Tammy Thompson then invited members and guests to enjoy a nice buffet dinner. After dinner Yusuf Nur, chair of the Awards Committee, emceed the awards ceremony, with 13 honorees being presented special plaques suitable for desktop display. Now in its second year, the Awards time has become a special tradition for the club. 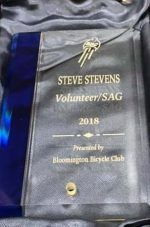 The presentation of the actual awards was preceded by the announcement of several tongue-in-cheek “raspberries” for several riders who had various misadventures on club rides. 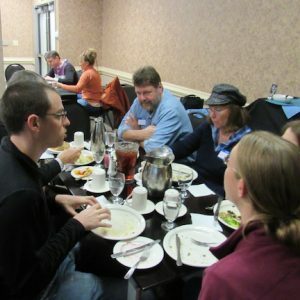 Curiously, despite the good attendance at the banquet, none of the raspberry winners were there! The meeting concluded with an overview by Jim Schroeder of planning issues related bicycling trails and routes in and around the city. More photos have been posted by Mike Finger and Warren Smith to the BBC Facebook Group and to the Evite page for the event. B-Line Trail and many attendees order supper and/or a beer. 1. Final accounting for RAIN 2016 and preliminary plans for 2017. 2. Treasurers report, showing that we’re doing well. 3. Advocacy topics: City Bike Ped Commission proposing to allow bicycles on sidewalks. Rail Trail now rideable past Dillman Rd to a new INDOT shelter. I69 updates. Morgan-Monroe side trail adjacent to Forest Rd. 4. Mountain Biking update, including special events, regular Wednesday evening and Saturday morning gravel rides will be posted on the calendar, and suitable maps are being collected on the website at Gravel Maps Page. 5. Grants process is underway, with deadline for applications set as December 31, 2016. See grants page for more details. The Grants Committee could use more members. Contact committee chair Brett Nelson at grants@bloomingtonbicycleclub.org if interested. 1. Plans to purchase a good quality events tent and tables for use at RAIN, Farmers Market, Open Streets, etc. 2. Quilt to be made from old t-shirts from RAIN, Hoosier Hills, etc. 3. Work on designating US Bike Route 235 through our area. Garnering approval of City and neighboring counties. 4. Support for City’s Big Jump Project, organized nationally via People for Bikes, will be handled through our grant process. 5. Pizza Party coming soon. 6. Nominating Committee will be formed to recommend candidates for VP, treasurer, and at-large at our annual meeting over the winter. 7. Gratuities for 2016 ride leaders. 8. Need for a new laptop for handling club finances. 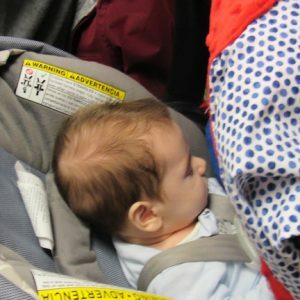 Thanks to club secretary Kathy Cummins for sharing her notes on which this brief report is based. Official minutes of board meetings are posted to the members-only portion of the website after they are formally approved at the next meeting. Here we’ll record tips for accessing our new BBC website. Expect changes and improvements as the site is fine-tuned. The login and password for members to access things like the membership roster, by-laws, board minutes, and restricted maps are sent to new and renewing members by the membership chair. 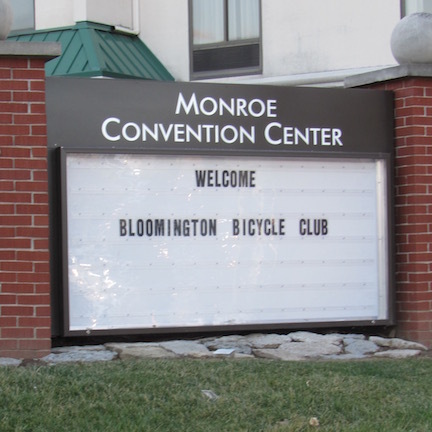 If you need credentials re-sent email membership@bloomingtonbicycleclub.org (currently Tammy Thompson-Madsen). On a mobile device, especially Android, it may help when accessing restricted PDF files to hold ones finger down, not just tap, on the link to get an option to open the link or download it, and then a login screen. Some of the menu items at the top of the page, or under the menu button in the mobile version, have sub-items and some do not. But in either case the top button may take you someplace that you can’t access via the sub-menus alone. Explore! Consider book marking frequently used pages, such as the calendar or the roster, for quicker and easier access. Right now it is people using ATT Uverse for home internet who are unable to connect to our home page. Let us know if you have ATT Uverse and are able to connect! As a trained first responder, the first thing to do is make sure all parties are not injured. If there are injured, call 911, or if a trained first responder is busy tending to injured, and others are around one person is ordered to call 911. After EMT's arrive, then you can proceed with all the rest that was described in this. Also, as our own club member just learned, use your cell phone and videotape all that you can. Photo's don't suffice in this day and age, as our law enforcement never can tell who's telling the truth, no matter how absurd one side's of the story is. What to do if you or a friend is in an accident? Introduction. Recently we received the following article about what to do after a bicycle accident, especially when a car is involved. It was written by a representative of an organization that makes referrals of personal injury lawyers, not by a lawyer, and not by someone local to the Bloomington area. Nonetheless the article makes some important points and raises important issues. It behooves us all to think a little about what we might need to do in such a situation. You may differ about some of the points raised and you might wish to make additional points. If so, please submit a comment or even a full proposed blog post response! Many Americans choose to ride bicycles instead of drive cars every day. In addition to the benefits to your wallet, health, and the environment, there are also the dangers of driving on roads with much larger vehicles. Even the most careful of bicyclists can be injured in a crash. The first step to keep yourself safe from crashes is to obey bicycle laws in Indiana. Here are a few rules every cyclist should be aware of to keep themselves safe. Bicycles must obey all motorist traffic laws. Hand signals must be used for turns when safe to do so. Between a half hour after sunset and a half hour before sunrise, bicycles must have a white light on the front, a red reflector and light on the back all visible from 500 feet. Bicycles can ride no more than two abreast on roadways. Bicycles must be equipped with a bell or other device to signal that is audible for at least 100 feet, but it can’t be a whistle or siren. Bicyclists must ride with two hands at all times when safe to do so. If carrying a package, the package can’t restrict them from holding both handlebars. Bicycles must be equipped with working breaks. Bicycles are only allowed to carry the number of passengers the bike was designed for. Extra passengers are not allowed in sidecars or otherwise not seated in a regular and permanent seat attached to the bike. First, be sure to call the police. They should file a report that includes all of the important details of the crash, which you may need later if you decide to file a claim with the driver’s insurance company. Be sure to give your statement of what happened to the police. All too often, bicyclists will be blamed for crashes. Next, you should take down the contact and insurance information of the driver. Look for any witnesses to the crash and point them out to the police, or take their contact information so that you may contact them later, as well. Be sure to take photographs at the scene and look for signs of hazardous road conditions or other helpful evidence that you may later need. Try not to discuss fault with the police or the driver of the vehicle, as anything you say admitting responsibility may be used against you later during insurance settlements. Above all, you should also make sure that you get medical treatment or visit the hospital, if necessary. Call 911 if you are unable to safely travel to a medical clinic or hospital. Some injuries are not apparent for hours or even days after a crash with a motorist. Finally, do not repair or replace your bicycle immediately. Take photos of the damage that was done to your bike, helmet, or other gear. This will be vitally important if you want to be compensated for the value of the damaged items. If you were injured in a bicycle accident, you may have had to miss work and lose out on wages, or pay for medical treatment. In this case, you will need to write a demand letter to the driver’s insurance company in which you seek damages for your claim. The demand letter should include a detailed account of the accident, your medical records and expenses, and any other relevant information. Insurance claims can be tricky, but so long as you have adequate evidence proving you were not to blame for the crash, you should be awarded the compensation you need to get healthy and back on the road. *This article was not written by an attorney, and the accuracy of the content is not warranted or guaranteed. If you wish to receive legal advice about a specific problem, you should contact a licensed attorney in your area. What other advice might readers like to offer? 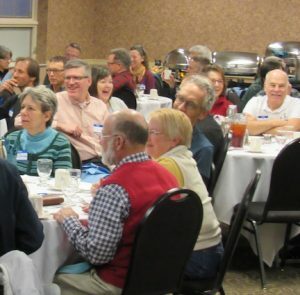 A spring-like evening in late February brought out a great group for the BBC annual meeting and banquet. 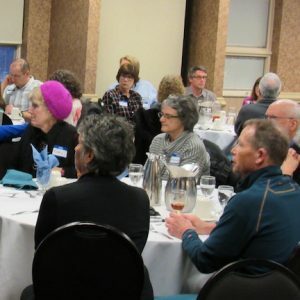 About 65 members and guests were in attendance and there was not an empty seat to be found. The evening began with fruits and veggies and mingling at 6 pm at the Convention Center. Then we had the business meeting required by our by-laws, chaired by club president Jim Schroeder. This included (re-)election of President Jim Schroeder and Secretary Kathy Cummins to new two-year terms. Brett Nelson, chair of our small grants committee, announced this year’s awards to regional groups for the promotion of biking and/or bike safety: Becky’s Place (Lawrence County), Boys and Girls Clubs of Bloomington, deCycles, Bloomington High School South Solar Bike Team, IU Police Department, Hoosier Mountain Bike Association (HMBA), and the Columbus Bike Co-op. In addition to these we also donate to towns or counties along the route of the Ride Across Indiana and to the statewide advocacy group Bicycle Indiana. Treasurer John Kalill reported on our finances. Short version: Healthy, maybe even robust. RAIN chair John Connell reported on planning for the Ride Across Indiana in July (check it out at www.rainride.org). It’s our 30th anniversary of the ride! A special registration deal of $30 during the first 30 days of January brought in almost a thousand registrants. We’re now at approximately 1,050 riders. Last year we didn’t hit that mark until sometime in May. Merchandise sales are proceeding similarly apace. It’s both exciting and scary! Ride Coordinator John Bassett reported on plans for the upcoming riding season. Once the business meeting was concluded we queued up for a nice buffet dinner. A special thanks to Tammy Berger, membership chair, for making all banquet arrangements! After dinner we finished out the evening with a round of “Razzies”; presentations of special awards; a presentation by past president Paul Arlinghaus of HMBA; and a slideshow about RAGBRAI, part of an effort to recruit a substantial BBC contingent for this famous week-long party on wheels in Iowa. Lifetime Biking Achievement Award presented to Joe Anderson (in absentia) by Dana Marsh. Most Improved Cyclist Award presented to Judy Akhras by Tammy Thompson. Outreach/Advocacy Award presented to Ron Brown by Jim Schroeder. Volunteer Award presented to Susan Bassett by Sylvia Schroeder. Service Award presented to Jennifer Miers by Ben Ekloff. Good Samaritan Award presented to Steve Galvin (in absentia) by Gail Morell. Mileage Maximus award presented to Dave Tanner by Warren Smith. These “serious” awards were preceded by “Razzie” awards presented by Jim Schroeder, which were more than slightly tongue-in-cheek. The “Hostess-with-the-Mostest Award” to outgoing membership chair Tammy Berger deserves special mention as being more serious than the others. The more in-fun awards included “Best-Dressed Award” to Stan Ellis, “n+1 Award” to Warren Smith (for owning the most bikes), “Yellow Pages Award” to secretary Kathy Cummins (for fingers walking across a keyboard). Other Razzies included the “AlkaSeltzer I Can’t Believe I Hit the Whole Thing Award” (for unfortunately getting all of a trail ballast) to John Boshears; the “Lance Armstrong Livestrong Award” (for coming back strong from illness) to Mike Finger; the “Moses Award” (for literally riding through water) to Yusuf Nur; and the “Persistent Bike Award” to Yusuf’s bike. You really needed to be there! Thanks to Kathy Cummins for help with this report.